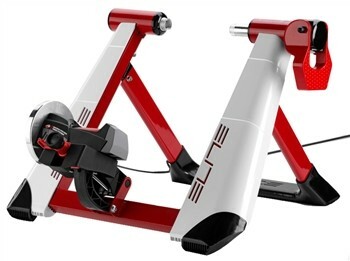 The Elite Novo Force is an elegant trainer that is designed to offer the key features you require in a turbo trainer at a reasonable price. It has recently been updated and now includes an Elastogel resistance roller that reduces tyre wear and noise as you workout. Its revolutionary frame is manufactured out of a combination of steel and technological plastic. There is a handlebar mounted resistance adjuster that has 5 positions to select from. The resistance unit is mounted to enable the bike to sit close to the ground. This increases stability and even rules out the need for a riser block under the front wheel. 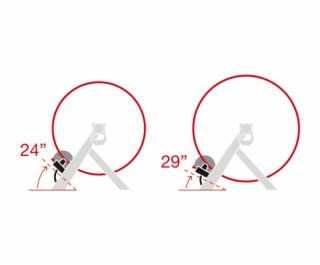 The Novo Force includes adapters to allow the use of any wheel size from a 24" BMX wheel to a 29" Mountain Bike. 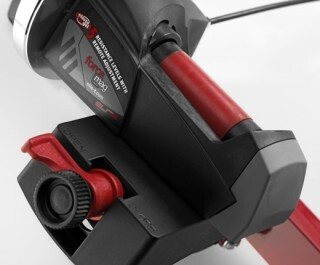 Other features of this trainer include quiet and smooth magnetic resistance unit, quick releases on the resistance unit and axle holders to make set-up easier and quicker, elastogel roller to reduce tyre wear and noise, and an extra quick release skewer for those using non-compatible skewers like Mavic. The Elite Novo Force is compatible with Elites app that allows you to monitor important cycling parameters, such as cadence and speed. Additional sensors may be needed to allow all functions. For a more interactive experience that allows you to race on Tour de France stages see the Elite Real range. RealTour, RealAxiom, and RealPower trainers.